There’s a newly discovered dwarf planet in our solar system, which was recently announced in Nature. The term dwarf planet should be used lightly here, since this new planet hasn’t been added to the official IAU list of dwarf planets. It doesn’t even have a name beyond its designation of 2012 VP113, though it has been nicknamed Biden (after the U.S. Vice President) by its discoverers. 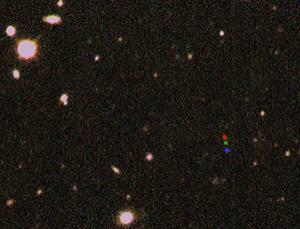 In some ways this new dwarf planet is similar to Sedna. Both bodies have orbits beyond the region of Pluto and the Kuiper belt, and there are similarities to their orbits in terms of eccentricity and orientation. Comparison of their orbits to dynamical models seem to indicate that both Sedna and “Biden” are inner bodies of the Oort cloud, which we know exists from the studies of comets but haven’t observed directly. 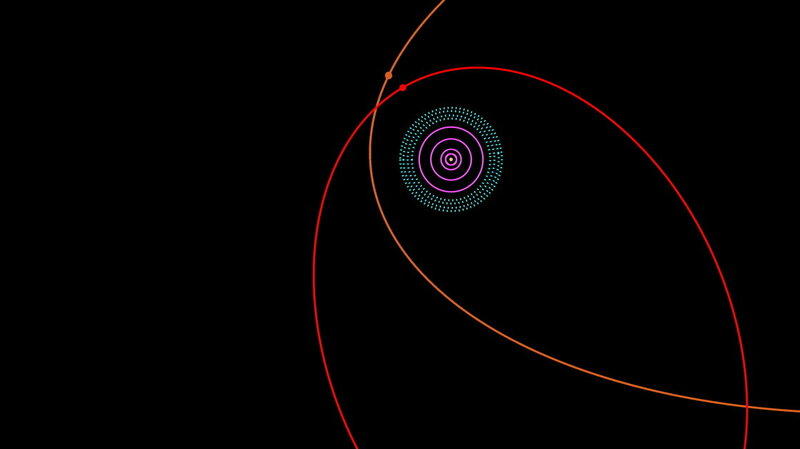 This likely means there are more objects with similar orbits yet to be discovered. The motion of VP113 over several hours is seen in red, green, and blue. Credit: Scott S. Sheppard. One of the more interesting aspects of this discovery is that the orbits of Sedna and VP113 seem to imply the existence of a much larger object even further out. Given the orbital similarity of the two dwarf planets, it is possible that they have a resonance with a large distant planet. When the team ran simulations to test the validity of this idea, they found the best solution was an object of about 10 Earth masses with a circular orbit of radius 250 AU. The authors clearly point out that this result is tentative, and there are other simulation results that work almost as well. But the possibility of a large outer body is interesting. Pluto and the other dwarf planets (official and unofficial) so far discovered are small. None of them are larger than the Moon. This is part of the reason there is such a clear line between planet and dwarf planet. But if there is an object of 10 Earth masses out there, it blurs the line a bit. On the one hand, it would clearly be of planet size, and in a fairly circular orbit. On the other hand it could be part of a larger system of Oort cloud bodies. But all that is hypothetical at this point. For now, we have another candidate dwarf planet, and it seems clear that more are out there waiting to be discovered.